Speaking at various ceremonies, Mayor Melis Myrzakmatov claims, “the city hall has restored the city over the last two years, and that is only the beginning.” Such pretensions claims brought two honorary titles at the same time: The best mayor 2012 and The man of the year 2012. What is rather curious is local journalists were the initiators of both events. The Alibi and Erkin-Too newspapers recognized him as the best mayor. 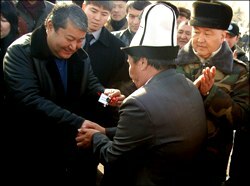 Babyrbek Jeenbekov, the Alibi editor in chief, presented Myrzakmatov with a certificate and a golden pen, while his colleague, Manas Osmonov, the Erkin-Too editor in chief, has only given a certificate. He said the mayor was awarded “for a massive work in Osh’s prosperity and development, for valuing historical and cultural values of the country, for cementing interethnic harmony, and for restoring peace and justice,” a press release circulated by the city hall quotes him as saying. “The work local authorities in Osh are carrying out must be an example for the entire country,” Osmonov summed up. 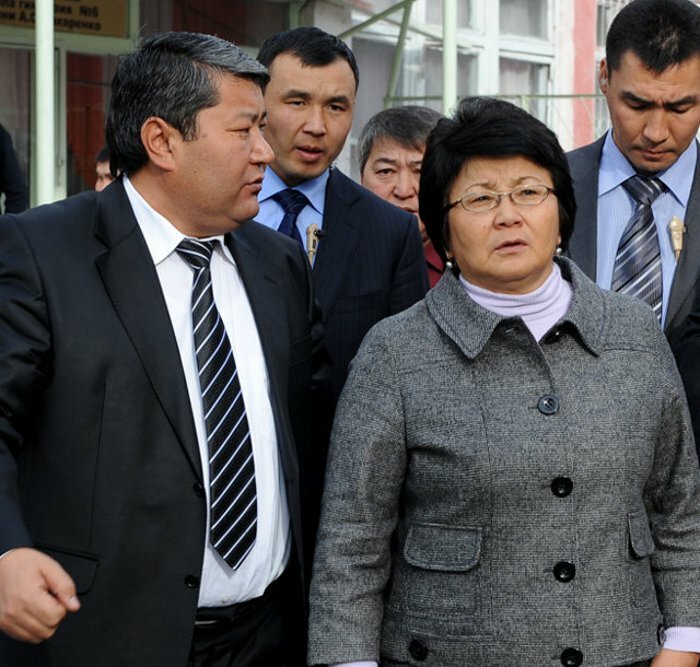 But is Melis Myrzakmatov really such a significant personality for Southern Kyrgyzstan? Is he really who he says he is? We talked to a native resident of Osh, who wished to remain anonymous, about this. He says Myrzakmatov is only pulling wool on people’s eyes and cares about his own personal benefit alone. “This is just another PR stunt. He has donned the crown of a restorer and is now walking around with it. It is sad to know that our mayor is just a conspicuous individual, and journalists are supporting that,” N. says (initial is fictitious). But Osh does indeed look different today, does it not? So, there are no visible traces of fires and arson in the city? What was the city hall’s contribution to the restorations in Osh? I never thought the city hall had contributed to the city restoration. On the contrary, Myrzakmatov actually resisted rebuilding the damaged houses. Everybody knows that the State Directorate for Osh and Jalalabad Restoration had issues with the Osh city hall over various issues. I remember how in 2010-2011 the mayor was asked not to interfere with the process of restoring the burned and damaged houses. He was trying to prevent owners from restoring their houses if they crossed a so-called “red line.” (Areas that some unknown urban planning designates as non-housing zones – Fergana.) He threatened that the city hall had all the rights to tear those houses down, should they be restored. There is no guarantee that these houses will remain intact in a year or two. Because the mayor can initiate the urban planning idea and those houses can be torn down. Has he said anything about this lately? He’s been silent so far, since mayoral elections are coming up in February. He obviously needs to construct a positive image of himself so the city council throws its unanimous support behind his candidacy. He is adamant in a desire to carve his name in stone in the city’s history, whatever the cost is. How independent is he from Bishkek? Whose support does he rely on? Even if the central authorities in Bishkek want to replace the Osh mayor, they will not succeed with Myrzakmatov. He has a reliable and tested method to resist changes: instill fear in city residents with his groups of armed bandits, kick those in the capital in the rear and continue his reign. Can you name anything that he did, which was bad for the city? There are several facts, which stir disrespect toward him. For example, he wanted to move the central bazaar from the city center to its outskirts, Kulatov-Zapadniy neighborhood. But that did not work, because both customers and merchants do not go there, but continue shopping at its old location. So, the bazaar remained within the city? Its limited sections, yes, not as big as it used to be. That was his mistake. Has not anybody in the city hall think about such consequences? It is funny to watch how the mayor receives city residents with problems. Many people think they will enjoy an attentive handling of their issues, should they bring them up with the mayor. And what does actually happen? His press service then circulates statistics that the mayor has received so many hundred visitors in a month. But people leave his office disappointed, because they believe in him, but he is quick to dismiss them. Yet, at the same time, he tries hard to maintain an image of a just fellow, who will always help the needy. In reality, he is just another raider and squatter, surrounded by blood-hungry hounds on two legs.